Hellyer Transmission & Automotive is your locally owned Deer Park, TX Front End Repair Shop since 1989. There are many factors that cause damage to the front end of your vehicle. Inner and outer tie rods pivot as you turn your steering wheel, and as you turn, ball joints attached to your wheels rotate. Worn out tie rods and ball joints effect the steering of your vehicle and cause premature tire wear. Shocks and struts absorb the impact of driving on rough roads and control the amount of up and down movement of your vehicle. Worn out or bad shocks cause premature tire wear as well. Some vehicles have steering gear boxes while most newer vehicles feature rack and pinion steering. We have the know how and tools to fix your vehicle and it will be back to original factory settings! All front end repairs are backed with a 12 month, 12,000 mile warranty. 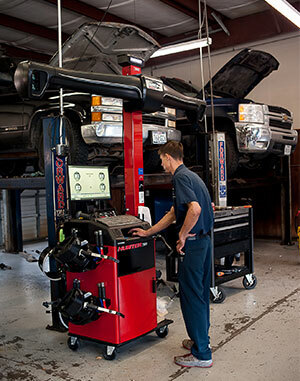 Call now to make an appointment with one of our Front End Specialists for a FREE Front End Alignment Check! Besides Deer Park, we service these cities nearby: Pasadena, La Porte, South Houston, Pearland, Friendswood, Webster, League City, Seabrook, and Kemah Texas. We use the "Hunter Hawkeye Elite" Alignment system. It features the most extensive vehicle information database in the industry! Vehicle-specific adjustments! Award-winning CodeLink steering system. So when we are done aligning your front-end of your vehicle, it will be back to original factory settings!